The CDF-11 (10.5 litres), is the smallest compressor cooler on the market. The CDF-46 (39 litres), a perfect compressor cooler for those on a budget with its great value and high build quality. The CF-11 (10.5 litres), is the smallest compressor cooler on the marke. The CF-16 (15 litres), is astonishingly lightweight and just as easy to handle as a thermo-electric cooler. The CF-26 (21.5 litres), keeps your food and drinks cold or frozen, even in the blistering heat. The CF-40 (37 litres), featuring Danfoss compressor, keeps your food and drinks cold or frozen, even in the blistering heat. The CF-50 (49 litres), featuring Danfoss compressor, keeps your food and drinks cold or frozen, even in the blistering heat. The CF-80 (79 litres), featuring Danfoss compressor, keeps your food and drinks cold or frozen, even in the blistering heat. The CF-110 (105 litres), featuring Danfoss compressor, keeps your food and drinks cold or frozen, even in the blistering heat. The BordBar TB-15 (15 litres), a compact thermo-electric cooler / warmer ideal for use in cars. An ideal, mid size cooler / warmer (15 litres) that can be powered off a 12v car cigarette lighter. The WCI-13 (13 litres), this rotomoulded ice box is lightweight, efficient, and easy to handle. 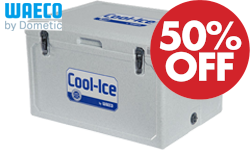 The WCI-55 (55 litres), this rotomoulded ice box is lightweight, efficient, and easy to handle. 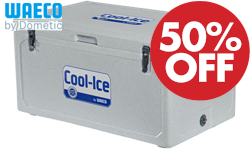 The WCI-70 (68 litres), this rotomoulded ice box is lightweight, efficient, and easy to handle. The WCI-85 (86 litres), this rotomoulded ice box is lightweight, efficient, and easy to handle.